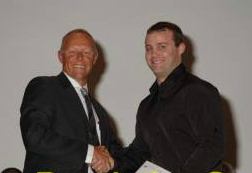 The other week Dave won an award for coming first in his course at the Sydney Institute of TAFE where he studies for his apprenticeship. There was an awards night which myself and his parents were able to attend, as well as the Big Boss from his work. It was a TAFE week for Dave so after I finished work I drove in to the city to meet him and we went and had dinner at The Meat & Wine Co. at Darling Harbour. The food, as always, was excellent; the service terrible! We were there for over 20 minutes before anyone even came and took our drinks and food order, and by the time the food actually arrived we had to scarf it down so quick to make it back up to Ultimo in time for the presentation that we didn't get to savour it or enjoy it. Very disappointing. The awards themselves were done and dusted pretty quickly, they motored through them, but the guy that was the emcee calling out the winners was terrible! It was like he couldn't read. He kept saying people's names wrong, and not even hard to pronounce names, simple ones like John and Andrew. Half the audience were sitting there following on with the program and anticipating what he would get wrong next and laughing every time he made a mistake. Which was often. There was a light supper afterwards which was basically a few pastizzi and fish cocktails and I must admit I chowed down on quite a few of those fish cocktails, they were good. Not totally hot but who cares, it was food that was there and ready when we were! To say I am a proud wife is an understatement! It's a testament to all of Dave's hard work and study that he has pulled this off. Dave is an apprentice printer, something that he has been working towards for many years. And when I say many years, I mean he has been working towards becoming an apprentice and eventually a printer ever since I've known him (over 10 years!). Almost three years ago he finally got selected to start an apprenticeship and he has seized the opportunity with both hands and is absolutely killing it. 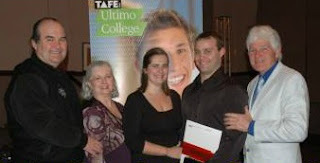 While he is technically a third year, he is currently doing his second year of the TAFE course (he goes to TAFE in week long blocks 6 times a year) and the award he received is for last year, his first year at TAFE. His plan is to try and come first every year that he has to go to TAFE and he just might do it. He gets 100% on almost every test he does and spends quite a bit of time studying and revising. There are two other apprentices at his work and he is kicking their butts. I am so proud of all the hard work and dedication to his study that he has shown and I'm so glad that he is doing something that he is really enjoying, and meeting and exceeding the goals he has set for himself. The $500 cheque's not bad either!